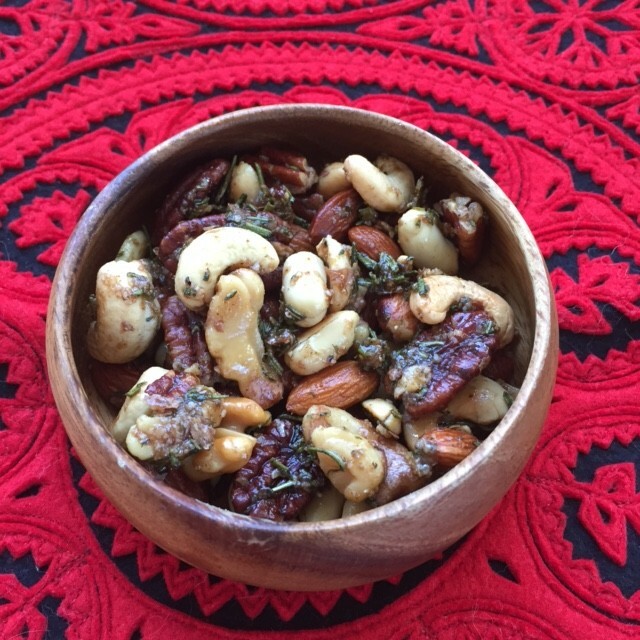 A delicious and addictive nut mix, perfect for entertaining and gifts! Peg's Salt is is a blended salt seasoning with over 20 spices. A woman-owned business, Cass Cannon launched Peg's Salt in 2012 and makes her product in Greenwood, VA from her mother's family recipe. Peg's Salt is all small batch made, and contains no sugar, fillers, MSG, gluten, or GMOs. It is also a perfect stocking stuffer for home cooks. Available at all area Whole Foods Markets, Arrowine and Westover Market in Arlington, through Relay Foods and online at www.pegssalt.com. Place nuts on a rimmed baking sheet and toast until brown, 10 to 15 minutes. In a large bowl, combine the rosemary, cayenne, sugar, salt and melted butter. Thoroughly toss the toasted nuts in the spiced butter while still warm. Mix with rubber spatula to keep nuts intact while coating them. Return nuts to baking sheet lined with parchment paper. Bake until nuts are semidry and the spice mixture slightly caramelizes, about 5 minutes. Remove from oven and let cool. Nuts can be stored in an airtight container for up to 3 weeks.